Virginia 895 / Pocahontas Parkway is a toll highway connecting Interstate 95 and Chippenham Parkway (Virginia 195) at Bensley with Richmond International Airport (RIC) and I-295. The expressway forms part of a belt route encircling Richmond, allowing traffic entering the Richmond area from Interstate 85 or U.S. 460 at Petersburg the opportunity to bypass the capital city for points north via I-95 or for points east via I-64. Due to construction costs for the high level bridge spanning the James River and associated wetlands impacts, Pocahontas Parkway was built as a toll highway partially funded by private investment. 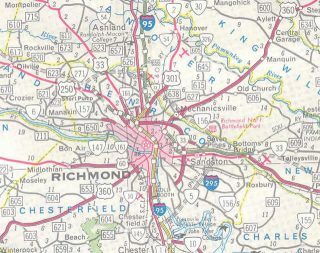 1968 Virginia Official State Map showed Interstate 295 proposed as a 270-degree beltway around Richmond. The 2001 Virginia official state map labelled SR 895 under construction as Interstate 895. Subsequent maps show the toll road as a state route. Planning documents and the project location map for SR 895 in 2001 also referred to Pocahontas Parkway as I-895. Pocahontas Parkway advances two miles east to a trumpet interchange with Interstate 295. The succeeding exit links with Airport Drive north to Richmond International Airport (RIC). Photo taken 06/01/03. Timberland spreads along both sides of SR 895 east leaing to Interstate 295 north to I-64 and south to Hopewell. Photo taken by Carter Buchanan (08/08/04). Britton Road passes over Pocahontas Parkway a half mile from the ramp separation for I-295 north toward Washington, DC and south toward Rocky Mount, North Carolina. Photo taken by Carter Buchanan (08/08/04). Interstate 295 leads 25 miles south to I-95 outside Petersburg and 18 miles north to I-95 by Glen Allen. Photo taken 06/01/03. Interstate 295 passes east of Richmond International Airport (RIC) ahead of Pocahontas Parkway west. Photo taken 12/30/12. Crossing White Oak Swamp Creek, a half mile north of Virginia 895 on I-295 south. Areas surrounding the exchange mostly consist of undeveloped pine forest. Photo taken 12/30/12. Entering the trumpet interchange (Exit 25) with Pochahontas Parkway west on I-295 south. Photo taken 12/30/12. Several subdivisions abut Interstate 295 on the approach to Virginia 895 west at Exit 25. Photo taken 12/21/18. Pocahontas Parkway west to Airport Drive north connects I-295 with the passenger terminal of Richmond International Airport (RIC) in four miles. Photo taken 12/21/18. Exit 25 loops onto Pocahontas Parkway westbound. 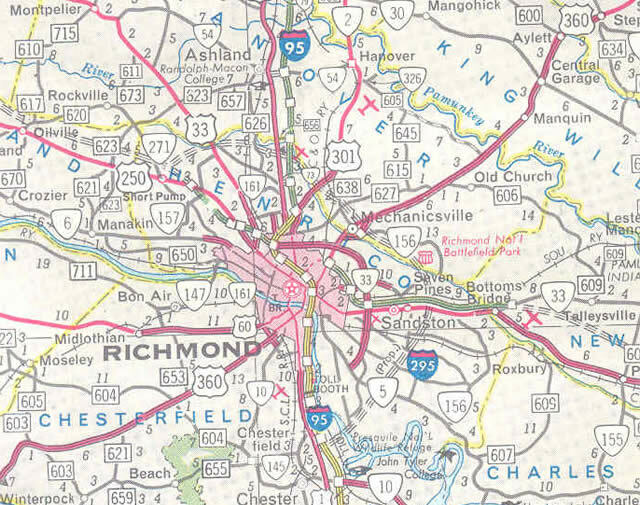 Virginia 895 west forms the southeast quadrant of a beltway system encircling Richmond. Photo taken 12/21/18. One mile south of the systems interchange (Exit 67) joining Interstate 95 with SR 895 (Pocahontas Parkway) east and SR 150 (Chippenham Parkway) north. Photo taken 06/01/12. Chippenham Parkway is a six-lane freeway extending northwest from Pochahontas Parkway to Powhite Parkway (Virginia 76) and Bon Air. Photo taken 06/01/12. Exit 67A departs from Interstate 95 seven miles ahead of Downtown Richmond for Virginia 895 east to Richmond International Airport (RIC). Photo taken 06/01/12. Virginia 150 (Chippenham Parkway) heads east a quarter mile from U.S. 1/301 at Bensley to the exchange with Interstate 95 and Pochahontas Parkway. Photo taken 01/01/17. U.S. 1/301 parallel I-95 (Richmond-Petersburg Turnpike) north into Richmond and south to Colonial Heights. Virginia 895 begins in a half mile. Photo taken 01/01/17. A lane drop occurs along SR 150 (Chippenham Parkway) east for the ramps to Interstate 95. SR 895 navigates along a rural route 8.2 miles east to I-295. Photo taken 01/01/17. Chippenham Parkway crosses over Grindall Creek and a CSX Railroad line leading into the multi level interchange with Interstate 95 and Pocahontas Parkway. Photo taken 01/01/17. Virginia 150 south transitions into Virginia 895 east across the Vietnam Veterans Memorial Bridge over the James River. Photo taken 01/01/17. “Interstate 895 Expected to Make Comeback in 1993 .” Richmond Times-Dispatch (VA), May 21, 1992 . “I-295 Road Project is Delayed, I-895 dropped in Budget Cuts.” Richmond Times-Dispatch (VA), July 17, 1987. “Chippenham-Laburnum Link Seen as Feasible Only With Tolls.” Richmond Times-Dispatch (VA), July 14, 1988. “Countdown Continues on Toll Roads.” Richmond Times-Dispatch (VA), June 14, 1992. “State Approves Funds for Design of I-895 – Eastern Connector Would Link I-95-295.” Richmond Times-Dispatch (VA), December 16, 1994. “$2 Toll Charge Seen for I-895 Connector – Major James River Bridge Part of Plan.” Richmond Times-Dispatch (VA), December 16, 1994. “Private Toll-Road Plan Backed.” Richmond Times-Dispatch (VA), March 22, 1996. “I-895 Connector Deal Closed – First Project Under Public-Private Transportation Act.” Richmond Times-Dispatch, June 4, 1998. Route 895 – Pocahontas Parkway. Roads to the Future (Scott Kozel). Email from Richard B. Rogers (01/21/03). Page updated February 22, 2019.